After using the traditional blogger template for the last 8 months, we have decided to move to a more professional and comtemporary design in 2008. Our focus with the new template is to provide you with a more confortable browsing and reading experience. The new design has more space and a search functionality,which will help navigating our expanding content. We have also introduced the email newsletter service so that you can receive new content directly in your inbox! We hope you will enjoy it. As Christmas is approaching (2 more weeks), we would also like to take the opportunity to thank you all for reading and contributing to SEO Sydney on regular basis. The last 8 months have been really good. The number of visitors has significantly increased, our PageRank has improved to 3 and our content has been featured in prominent online media. Once again we would like to thank you for your help in achieving those results. In 2008, we expect SEO Sydney Blog to continue growing. We are planning on creating partnerships with more Australian international SEO blogs, increasing the post frequency and keep on bringing rich content on the Australian SEO market. According to Zenith Optimedia, The Internet Advertsing Bureau and PriceWaterHouseCoopers, Australian Businesses are allocating around 14% of their total advertising budgets in online advertising (including search, classifieds and display). 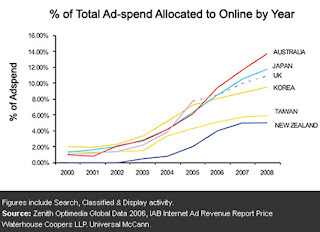 The online share of total advertising budget in Australia is the highest in Australasia and even higher than in the UK. Australian Businesses seem to have a more mature attitude towards online advertsing compared to their Australasian counterparts. On the other end, New Zealand seems to be far behind. The right candidate also has excellent written, verbal, organizational and time management skills; can work independently and with a team; and is able to quickly learn complex software products. The successful candidate will receive a generous remuneration package ($50- 75K package) and ongoing career development is a huge priority for company so there are plenty of opportunities to progress for the right person. As shown on the graph, the Australian market shares similar trends with the US market. However the magnitude is quite different. Facebook's audience has skyrocketed in the last couple of months with a 400% growth since June 2007, while MySpace has not grown much. 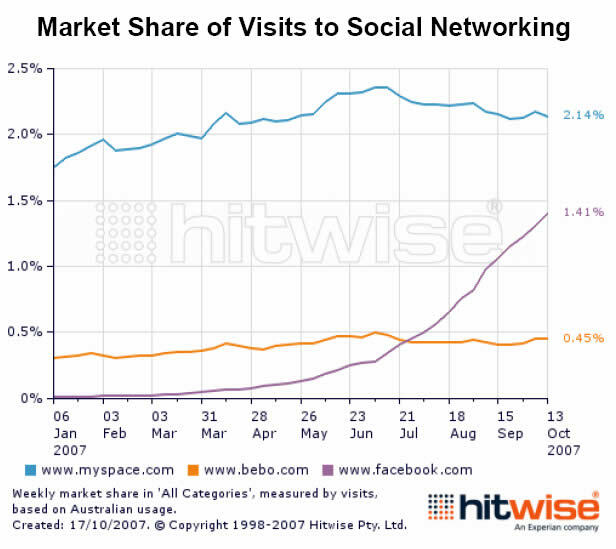 In the last couple of months, Facebook has even taken the second position leaving Bebo behind. My Space is leading with larger audience, but the trend might change if FaceBook keeps growing at the same pace.